The following directions for preserving autumn leaves preceded several recipes for Charlotte Russe in an 1854 cookbook. After being flattened, varnished and dried, the leaves “formed into wreaths for the hair, or trimmings for ball-dresses…” I have not come across any dresses with Fall leaves as described below, but these two examples seem to show real leaves (Georgian, 1823) and salvia (Antebellum, 1860). AUTUMN LEAVES.—The autumnal colours of our American forest trees are justly admired for the brightness, richness, and variety of their tints. 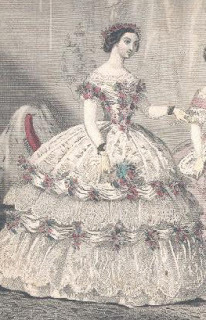 Some of our fair countrywomen have worn them in Europe, formed into wreaths for the hair, or trimmings for ball-dresses, and the effect was considered beautiful. They may be preserved for this purpose by the following process. Gather as many varieties of autumn foliage as you can obtain; seeing that every leaf is perfect, and that there is a stem to each. The best time is in the month of October. Include among them those of the crimson maple, the purple beech, the willow oak with its underside of silvery white, the yellow hickory, the aspen, and any others that are richly tinted by the frost. Also, by way of contrast, some green pine sprigs. Lay them separately between the leaves of a large writing-paper book, (an old ledger will do very well,) and do not put tree leaves between all the book-leaves successively, but alternately; otherwise they will not be smooth and flat when pressed. That is, put tree-leaves between the second and third pages of the book, and then no more till between the sixth and seventh pages. Lay the next tree-leaves between the tenth and eleventh pages, and so on, till they are all in. Place several other heavy books upon the ledger so as to press well the leaves beneath. Stretch a twine across the room, or from the backs of two chairs, and tie a small twine string to each stem. Have ready some very fine clear varnish, (such as is used for maps, & c) and with a large camels' hair brush, go carefully over both sides of the leaves, including the stem. Fasten them all, separately, to the stretched twine; seeing that none of them are near enough to each other to touch. Then lock the door of the room, that nothing may get in to disturb them, or raise the slightest dust while the varnish is drying. When perfectly dry, and not in the least sticky to the touch of the finger, have ready some sheets of smooth thick white paper. In each sheet cut small double slits to admit the stems, and in this way secure the leaves from slipping about and being injured. Write the name of each leaf above it. Let the other half of the sheet lie upon them. Put these sheets within a double cover of binders-board, (like a port-folio,) which you must then seal up in paper, like a large parcel, and the leaves in all their autumn beauty may be safely transported to any part of the world. They will be found very useful to landscape-painters. 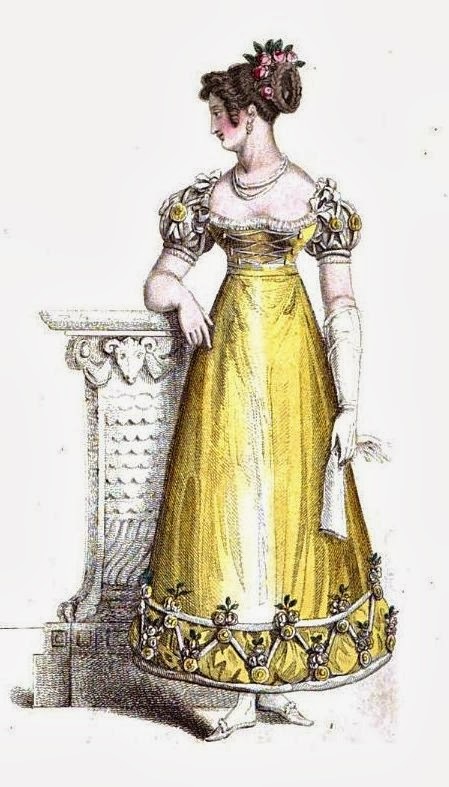 "...Round dress of amber coloured crape, a puckering of gauze of the same colour at the border, finished by rouleaux, wadded very full of white satin, with full blown white roses, and a few leaves of green foliage: under each rose is an antique ornament of the rosace kind, composed of white satin, with a tuft of amber in the interior. The body of this beautiful dress is of satin…"